It was not really a surprise that the Giants put their new left fielder on the disabled list Saturday. It was a surprise that he was joined by the leadoff hitter. 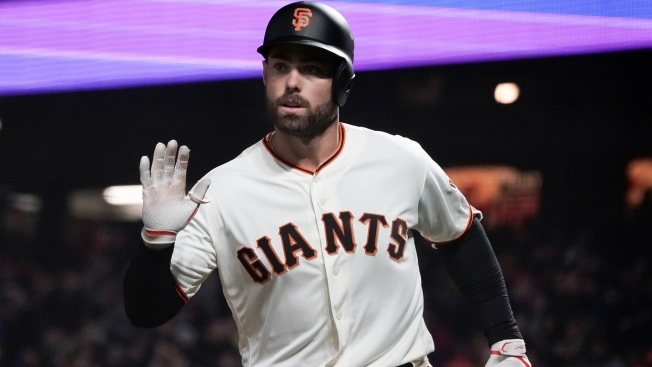 Mac Williamson went on the 7-day concussion DL and Joe Panik was put on the 10-day dL with a sprained left thumb before a doubleheader with the Dodgers. Austin Slater, who was optioned after Friday's game, was called back up and started in left field. Alen Hanson, a burner who was in camp, had his contract purchased to provide infield depth. Mark Melancon was transferred to the 60-day DL to clear a 40-man roster spot for Hanson. "You hate to lose your guys, ever, your core players," manager Bruce Bochy said. "Joe was hitting at the top of the order every game and he's so steady. This is one we'll have to weather and push on. And Williamson, you look at what he's been doing, this is a bad break for him and for us." Panik was hurt while tagging Yasiel Puig on a pickoff play early Friday night. He stayed in the game with his thumb wrapped, but it was sore Saturday morning and he went for an MRI. He will see a team doctor during the first game of the doubleheader but Bochy anticipates Panik missing more than 10 days. Williamson took batting practice yesterday and felt no effects three days after tumbling into the wall in left field. But he had one more concussion test to pass Saturday morning and he felt lightheaded. Slater likely will get most of the time in left for now and Kelby Tomlinson and Hanson will ham and egg it at second, Bochy said. Hanson was hitting .403 with three homers and six stolen bases at the time of his promotion. The non-roster invitee is one of the fastest players in the organization.